Hello I'm legotron123. You may remember me from such defunct RPs as Snow Tunnels, the original Apollo city, 17th century fox, Pokepets and my ill fated attempt at a superpets RP (which failed because I didn't think out how the rules would have to go for such an RP and I didn't have a reputation as a good RPer yet). I've been playing a lot of FTL: faster than light lately and I thought of a new idea for an SRP that's basically FTL mixed with Star Trek called STEELHAVEN. I'll game master it. The setting is the year 3000 and the starship Steelhaven (from which the title of this STP comes), a earth republic Emperion class ship that's visually based on the ship eight track from transformers (link here: http://tfwiki.net/wiki/Eight_Track_(G1) ) minus the big cannon on top. It has three purposes. Restock republic stations across the galaxy, the occasional exploration trip, and in very rare cases, battle hostile forces. The republic is at war with a group of rebels calling themselves the insignia, who occasionally attack the ship or the stations it visits. The ship is occasionally attacked by some lone pirates or by a organized group of pirates called the Barbarax. The rebels and pirates would occasionally (I'm saying that word a lot in this, aren't I) board the ship or need to be boarded themselves, which allows me to transition to my next topic, new mechanics. The mechanics of this RP are mostly the same as the others except for a few new things, mainly two new stats and the stat total being updated for those stats. The ship would be damaged in fights and various incidents, plus the aforementioned boarding, which requires two new stats to be introduced, repairing and combat. The repairing skill shows how well you can repair things, 10 being not only can you repair almost anything, but you can construct almost anything you need from scrap, 1 being you can't even glue a broken part back on without the bottle slipping and bouncing around and braking things. The combat skill shows how brave and skilled you are in a fight, 10 being you can take down foes over twice your size, 1 being you give up when whenever someone even slightly threatens you. Make sure you portray the fighting realistic to your combat level! We're not going to have the equivalent of a "everything proof shield" here. To acomidate to these new stats, the stat total will be updated from 42 to 54. The ship contains numerous habitation suites for its crew, various offices and workshops for those who require them, a tavern named Black Hole Bar and Grill and multiple other recreational facilities for the crew members to have fun and relax. The ship's hangars carry an unknown number of shuttlecraft, including the captains personal spacecraft and a shuttle used for landing parties and diplomatic missions. Each crew member has their own habitation suites that they share with their family or, if they didn't bring their family, a few roommates. Players can choose what rank they want their character to be, however my character is the captain of the ship, and no ones rank can be above commander (we'd use the rank system from Star Trek in the 24th century, with the addition of crewman below chief petty officer), except for the occasional guest character I'll bring in. In this SRP animals are equal to humans in every way except height. There are even cross species adoptions, which my characters are a part of. * As always, no one will die. There may be close encounters but the only people who will die are the usual red shirts that always die in scifi stories. This doesn't mean you can have your character do insanely dangerous things and expect to get off scot-free. If this becomes a problem, then your character gets injured and can't leave the medbay for a certain amount of time, varying on how stupid the action your character took was. There may be exception to this, but only under very specific circumstances that I must approve. * There will be battles, in the ship, in space and on planets. However these will be regulated by me and the assistant GM. No violence that goes beyond a PG rating. * Portray your characters fighting as realistic to their combat level. You aren't going to take on a 7 foot muscle filled jock and win, not unless he has severe bone cancer. * There will be multiple storylines over the course of this roleplay. From time to time you may recive a PM with information crucial to the story. Please take this information into account when posting in the IC thread. I can't think of anymore rules that wouldn't just be repeats of the ones that apply for every RP so that's it! Last edited by Legotron123 on Thu Dec 01, 2016 6:36 pm, edited 6 times in total. Appearance: Wears the standard security personnel uniform. Average Shepard fur pattern and build. Notes: Once he is comfortable around a person he will open up and be more kind over short and cold. He was punished due to disobeying the commands of his superior and let a minor criminal go to save the one he loved during a fire fight. His commanding officer had been very disproving of Stephens relationship with his daughter (who was the one he saved), this being the last straw; Stephens was assigned a new post. He will do what is right to him, as long as other lives are not at risk. He tends to spend his free time working out or sitting in the gardens collecting his thoughts. His apathetic attitude leads him to be a bit harsh in controlling a situation. .
Last edited by Jacey on Sun Feb 01, 2015 2:13 pm, edited 3 times in total. Appearance: White is the main color of his body with a black line running up from his nose, splitting in two and winding their way down his side's. These thicken to cover almost his entire sides. He wears a collar with the caduceus as a tag along with identification numbers and general info in a chip inside of his collar. The collar itself is a bright orange nylon. 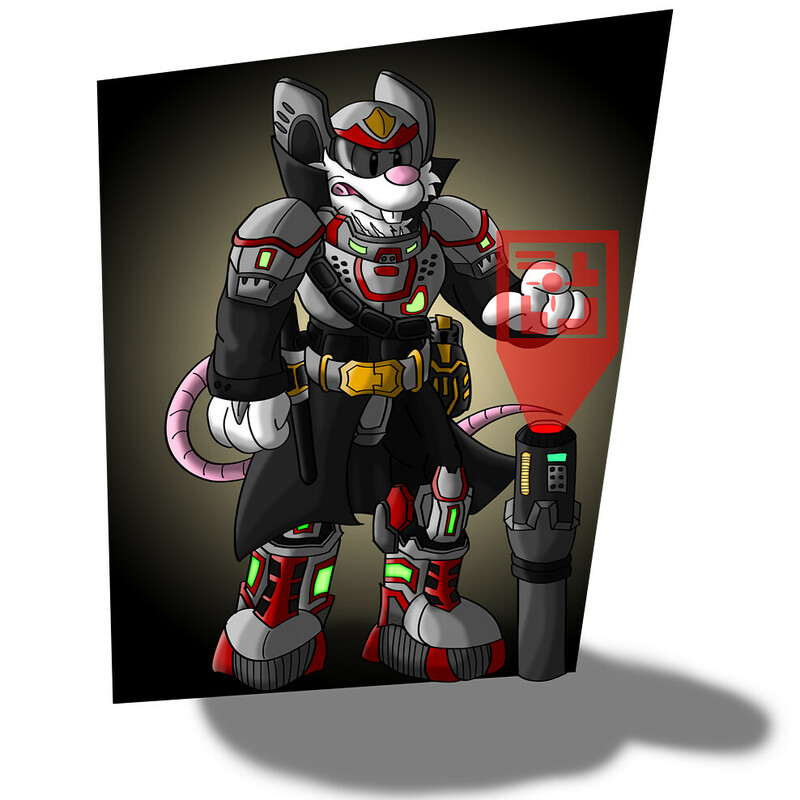 He also has a nifty cybernetic eye that allows him to see heart rate, mental activity, thermal imaging and can have 3D models of people linked to it from a handheld device, also allows for basic night vision by allowing more light in and enhancing it. This is mainly for medical purposes as the thermal imaging cannot be used through most materials and both heart rate and mental activity monitors have to have a direct line of sight. This results in one of his eyes being a sort of pine green while the other is an icy blue. He carries a small collar mounted field kit in case of emergency. Personality: Helpful, tries to lend a hand if he can. Though when he's working he can get incredibly serious. Backstory : Colorado was picked up from an animal clinic adoption day by his owner, Doctor Wolf Vanderbilt. His owner was a bit of a loner and as such Colorado only really gained people skills fairly recently. He may be a bit blunt and quick to blurt out things, but he's working on it. He studied for a few years and eventually gained the requirements to be a medical technician. After winding his way up the rank ladder a rung or two, there wasn't much competition, everyone wanted to be a cool pilot or an admiral, he was promoted to Senior Medical Technician, a Lieutenant equivalent for medicine and shipped off to the Steelhaven. He and Wolf do not make contact that much anymore. Mainly due to workloads on Wolf. - He loves jokes, very fun loving and tries to get along with anyone. - He likes to explore. He is an adventurer. - He was a combat medic at one point. Fun times ensued. Appearance: He's a white Mouseof roughly 4ft in height. Lithe and often menacing despite his more limited height. He sometimes smiles. Usually when combat is inevitable. Usually wears a helmet and grey armoured padding uniform.Has a knife rig in his outfit which can spring knives into his hands if needed. Regularly wears a gun and a shok-stik that can stun most targets. Possesses a wrist mounted communicator. From a line created in a laboratory many, many years ago. Personality: He's abrasive but good at his job. He has few friends as he often fears he may end up having to investigate them. Not lacking in intelligence but prefers the standard 'peace-keeping' aspect. Other Notes: He has passed the piloting basic course whilst on military service and will often go for the military solution. Proficient with a firearm and dangerous with a knife, he bears the scars of victory across his body along with one on his forehead - under the fur. Give me something to do and I'll do it. Last edited by Welsh Halfwit on Wed Aug 17, 2016 12:37 pm, edited 4 times in total. Appearance: Blitz is a German shepherd with Light brown fur. and standard German shepherd markings. He's also thinner than most German Shepherd's due to space travel. Blitz wears a white jumpsuit with green and red sensory tabs. These tabs allow Blitz to monitor his heart rate and communicate with "command". But we'll get to more of that later. 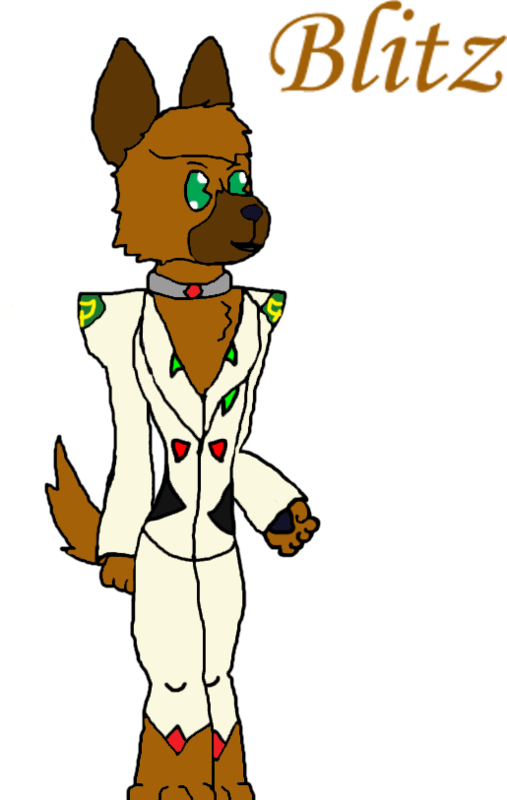 Personality: Blitz is a polite dog, always stopping to help someone that needs help, even if its a tiny job. Most girls (and guys) find him to be a prince charming. Unless someone's opinion is violent, he'll respect their opinions and stay silent about his. This normally causes him to be the deciding factor in most arguments between his caretaker/consultant, and his boss/exosuit inventor. Other Notes: Blitz is the animal pilot of Golem Incorporated's exosuit testing. Put him inside an exosuit, and Blitz can use it to obliterate small asteroids, destroy large asteroids, and decimate any hostile spacecraft. Other than that, Blitz has only basic schooling, basic fire arm training, apprentice hand-to-hand combat, Nationally recognized sword skills, and extreme exosuit piloting skills. Appearance: Doctor Rain is a tall, lanky man with longish white hair. He wears circular glasses and a white lab coat. Personality: Doctor Rain is like the mad hatter. He normally does whatever he wants when it comes to exosuit creation (despite budget limitations). When it comes to social interactions, he couldn't care less about what other people are talking about. He's also crazy in his own way, but very devious. Luckily, he's a good guy, so he won't burn your house down. Other notes: Would you like me to write some more useless information down, or can I get back to playing with my toys? I know, I'm pretty anxious too. This seems like a really fun RP and if it goes well, one that should be able to be played out fully. Appearance: Regular build. Black overcoat on the back with white black-speckled (known as 'ticked') undercoat all over the body. top of the head is black (Known as a 'mask') with Tan patches on the cheeks. Ears are flopped and black. Wears simple light brown overalls with patches of dirt and grime on the knees, elbows and up the forearms. Usually with a dirty rag or cloth hanging out the left-rear pocket. Also seen carrying a large red toolbox. Personality: Energetic, yet laid back, Dan always listens to his friends and senior officers. Once he starts a task, he won't stop until it is fulfilled, that's if you can get him to start.. He can be stubborn at times, but is usually happy to help. His mantra: If you don't ask, you don't get..
Background: Born and raised on a ship repair dock by his adopted father, Ernest Lionheart, who is a Ensign mechanic for the republic, Dan knew his way around a wrench at a young age. Living on the dock and working on ships with his father was his favourite pass-times. He got recruited to the republic at quite a young age too, one of the youngest in fact. He didn't do too well in combat training and didn't even get to hold a gun at all due to his clumsiness, yet he did well and even excelled in the other classes. He spent most of his years in service on the same repair dock he grew up on, and only got one promotion for doing so. This promotion, however, got him a place on the STEELHAVEN..
S: 8 "Ever tried to do one of those old manual car-jacks?" P: 5 "That seems to be in order.."
E: 7 "I used to work from about.. 7 'till 5.. Non-stop." C: 4 "I write better than I speak.."
I: 8 "All from spending years on the dock.."
A: 7 "Natural instincts, I guess.."
L: 3 "If I didn't have bad luck, I'd have no luck at all.."
R: 10 "If a job's worth doing, It's worth doing right!" CB: 2 "Erm, heh.. Maybe we can talk about this..?" I am Really anxious to start! Let's boldly go! Yea, I messed up. I forgot to make a post after the first one to show the rules and the people playing. Anyone how to fix that? You could edit the first post. I'm worried I'll run out of space. Can the mods shift around posts or something. - Copy and paste your character sheet into a new post. - Then, remove your sheet from the post. - Now, rework the first post so its easier to read. - write the rules in a new post and paste the link to the rules in the first post. - Create character list in a new post. - Copy and paste a link to the character list into the first post. Appearance: Black with silver paws. Wears blue vest standard for lieutenants, along with Power Gloves (it's so bad) that look like spandex, which have taser pads that are activated by him clicking his tongue. Personality: Lewis is only 17 (pet years) but he already outranks 66% of the ship. He was adopted at age 4 (still pet years) by his mom, Liz, and has spend the last 13 years (still pet years) with her, 9 of which were spent on the STEELHAVEN. He likes having a position of power, but tries not to abuse it. He's kind to people he thinks deserve it and is cold to people he think doesn't deserve it. Liz wasn't able to spend much time with him back on earth, so he didn't learn a lot of so called "people skills," but he can tell when something's too mean. He was very excited when they were assigned to the STEELHAVEN, as it meant he could spend more time with her. He's not as much of a mamas boy, but he still loves her very much. He tries to be a good person, but doesn't always succeed. An easy way to get him mad is to call his power gloves spandex. Is capable of piloting ships emperion class and lower, as well as power loaders, exo-suits and turrets. His favorite food is meat lovers pizza. Vents out his frustrations by playing godzilla in the hologram room. Appearance: White with brown hair and blue eyes. Wears orange vest standard for commanders. Personality: Liz worked hard to become a captain and she takes it seriously. That doesn't mean she can't take a joke. As long as she finds them funny, you can make as many jokes as you want. She's kind to those who earn it. She loves her adopted son very much, but she tries not to show it in public. Last edited by Legotron123 on Wed Aug 27, 2014 3:45 pm, edited 1 time in total. Lego, the description still looks bad, and you didn't repost your character sheet in a different post. It'd be much easier to get rid of your character on the first post and keep the rules on the first with the description. Another thing would be to add a character list instead of a player list. I switched things around so that the rules are in the main post and my character is down here. I would have done it sooner, but I've been a bit busy getting ready for school. Appearance: Average height, slender/athletic build. Snowy white with patches of yellow fur on ears, face, chest and tail. Hair/fur cut short, despite being a longhaired cat. Has a large wardrobe but is often seen in command uniform; a navy overcoat she wears over a thin layer of plate armor. Standard dark trousers and boots. Personality: Hard-headed, determined, ambitious. Somewhat stubborn but will conform to reason. Cautious around others, perhaps overly so. Paranoid and anxious, she is often hard to approach and it will take some time before she learns to trust someone other than herself. Prefers to be alone but does not mind the company of the people she is familiar with. Pensive and mindful, she usually keeps a calm demeanor and is rarely seen annoyed or angered. Also rather blunt and to-the-point, and likes to get the job done quick, but will often go out of the way for personal benefit. Though honorable, she will sometimes turn to deceit if she see no better option; although, she would never betray those who are close to her. Backstory: Both Ashleigh's mother and father were experienced soldiers and expert pilots. Ash looked up to her parents and it was her dream to become just like them. Unfortunately, during the third war, her mother was killed in action and after the fighting was done, her father fell into deep depression and expressed his grief by becoming a combat medic, hoping to give others what he could not give to his beloved. Ash took this as a sign of weakness and enlisted for the military with duty and revenge in mind. Some few months later, she takes her father's place as the strength of the family, and looks forward to her possible promotion, and to the discovery of the identity her mother's murderer. - Through her long months of intense training and hardship, Ash discovered that she has a natural talent for fighting. She graduated battle academy at the top of the class. - Proficient in the martial arts and unquestionable skill as a marksman. - Her preferred weapon is a longsword. She has yet to be defeated in a swordfight. - Has basic knowledge of piloting aircraft. - Feels indignant towards those she perceives as weak-willed. Corps' comment about the chef actually fits very well with a plotline idea I have in mind. I'm not going tell you what it is, other than I can't do it if no one volunteers their character for a position I have in mind. It has to be a main character for the idea to work though. I don't want to spoil the surprise for the others so I'll PM you for advice (which I should have done earlier since that's your job as assistant GM). Let's just say I wouldn't do anything to your characters that I wouldn't do to mine. I felt like Barry might need a demotion since we didn't have a lower rank security officer. Or that's how I keep precieving the RP. This way we shouldn't have a power struggle now right? (it is only one rank lower). Is that okay? Fine by me. He'd intend for Barry to be a second in command for Security anyhow. AFTER talking with him first. I'm very sorry about that, I didn't mean any disrespect. I've rewritten it, if any of the quotes of me feel the need to require, do so. Hey, Lewis hasn't walked out yet. Captain is waiting for questions. So neon, is golem 6 the newest model or has another one come out? Golem 6 is the latest model for the public. 7 is only available for pre-orders, and the model's Dr. Rain has on board are only for Blitz and the other test subjects. Captain Liz is still on the bridge deske. Please edit your post. Appearance: He's a white Mouse of roughly 5ft(5ft 5) in height. Lithe and often menacing despite his more limited height. He sometimes smiles. Usually when combat is inevitable. Usually wears a helmet and armoured padding uniform.Has a knife rig in his outfit which can spring knives into his hands if needed. Regularly wears a gun and a shok-stik that can stun most targets. Possesses a wrist mounted communicator. 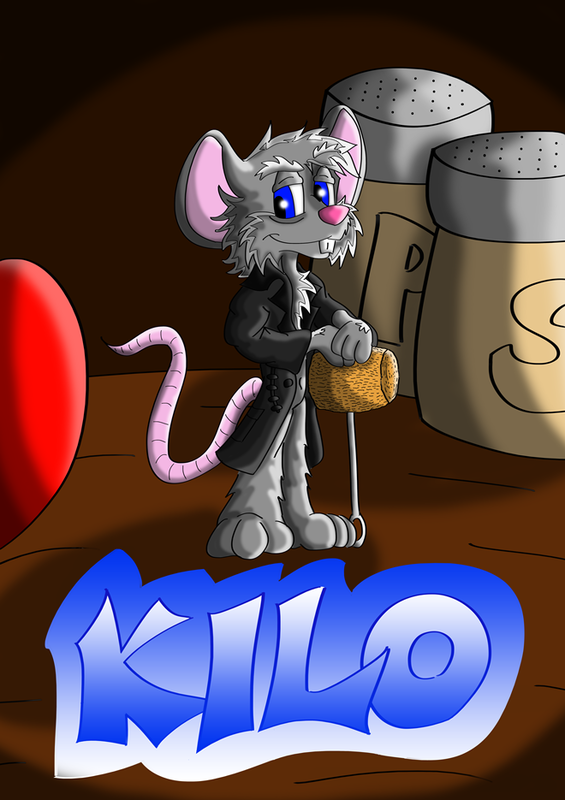 And, here's how he looks from the wonderful Hukley! Last edited by Welsh Halfwit on Wed Aug 23, 2017 10:10 am, edited 2 times in total. Er, well, you already did, just not the picture. I've always pictured the Corp to be more on the scrawny side, with a mean face to go with. But Hukley's rendition is really good too! So neon, golems have passenger seats? Yes, it is slightly elevated from the passenger seat, highlighting enemy targets and providing objectives. A.I's are too expensive for "cheap golems"
Now, having a co-pilot in the golem with you or not doesn't matter thanks to battlefield wireless communication. It has a limited range of 2 miles, so don't go too far away from your ship or co-pilot. Awh, so no mech fight?